(Jeremy Harmon | The Salt Lake Tribune) Brigham Young Cougars quarterback Zach Wilson (11) throws the ball as BYU warms up before facing the Western Michigan Broncos in the Famous Idaho Potato Bowl in Boise, Idaho, on Friday, Dec. 21, 2018. (Jeremy Harmon | The Salt Lake Tribune) Brigham Young Cougars wide receiver Akile Davis (1) catches the ball as BYU warms up before facing the Western Michigan Broncos in the Famous Idaho Potato Bowl in Boise, Idaho, on Friday, Dec. 21, 2018. (Jeremy Harmon | The Salt Lake Tribune) Brigham Young Cougars quarterback Tanner Mangum (12) warms up as BYU gets ready to face the Western Michigan Broncos in the Famous Idaho Potato Bowl in Boise, Idaho, on Friday, Dec. 21, 2018. (Jeremy Harmon | The Salt Lake Tribune) Brigham Young Cougars quarterback Tanner Mangum (12) and Brigham Young Cougars running back Tyler Allgeier (45) warm up as BYU gets ready to face the Western Michigan Broncos in the Famous Idaho Potato Bowl in Boise, Idaho, on Friday, Dec. 21, 2018. (Jeremy Harmon | The Salt Lake Tribune) Western Michigan Broncos wide receiver Jayden Reed (87) fumbles the ball as BYU faces the Western Michigan Broncos in the Famous Idaho Potato Bowl in Boise, Idaho, on Friday, Dec. 21, 2018. (Jeremy Harmon | The Salt Lake Tribune) Western Michigan Broncos quarterback Chris Riddle (4) is tackled by Brigham Young Cougars defensive back Dayan Ghanwoloku (5) as BYU faces the Western Michigan Broncos in the Famous Idaho Potato Bowl in Boise, Idaho, on Friday, Dec. 21, 2018. (Jeremy Harmon | The Salt Lake Tribune) Brigham Young Cougars quarterback Zach Wilson (11) is chased out of bounds by Western Michigan Broncos wide receiver Anton Curtis (3) as BYU faces the Western Michigan Broncos in the Famous Idaho Potato Bowl in Boise, Idaho, on Friday, Dec. 21, 2018. (Jeremy Harmon | The Salt Lake Tribune) Brigham Young Cougars wide receiver Dylan Collie (3) scores the first touchdown of the game as BYU faces the Western Michigan Broncos in the Famous Idaho Potato Bowl in Boise, Idaho, on Friday, Dec. 21, 2018. (Jeremy Harmon | The Salt Lake Tribune) Western Michigan Broncos running back LeVante Bellamy (2) is tackled by Brigham Young Cougars linebacker Sione Takitaki (16) as BYU faces the Western Michigan Broncos in the Famous Idaho Potato Bowl in Boise, Idaho, on Friday, Dec. 21, 2018. (Jeremy Harmon | The Salt Lake Tribune) Western Michigan Broncos running back Jamauri Bogan (32) dives for a touchdown under pressure for Brigham Young Cougars defensive back Austin Lee (11) as BYU faces the Western Michigan Broncos in the Famous Idaho Potato Bowl in Boise, Idaho, on Friday, Dec. 21, 2018. (Jeremy Harmon | The Salt Lake Tribune) Brigham Young Cougars wide receiver Dax Milne (82) fumbles the ball as BYU faces the Western Michigan Broncos in the Famous Idaho Potato Bowl in Boise, Idaho, on Friday, Dec. 21, 2018. (Jeremy Harmon | The Salt Lake Tribune) Brigham Young Cougars defensive back Keenan Ellis (30) celebrates with teammate Brigham Young Cougars wide receiver Talon Shumway (21) after scoring the first touchdown of the game as BYU faces the Western Michigan Broncos in the Famous Idaho Potato Bowl in Boise, Idaho, on Friday, Dec. 21, 2018. (Jeremy Harmon | The Salt Lake Tribune) BYU takes the field as they face the Western Michigan Broncos in the Famous Idaho Potato Bowl in Boise, Idaho, on Friday, Dec. 21, 2018. (Jeremy Harmon | The Salt Lake Tribune) Western Michigan Broncos quarterback Kaleb Eleby (9) is chased by Brigham Young Cougars defensive lineman Uriah Leiataua (58) as BYU faces the Western Michigan Broncos in the Famous Idaho Potato Bowl in Boise, Idaho, on Friday, Dec. 21, 2018. (Jeremy Harmon | The Salt Lake Tribune) Brigham Young Cougars wide receiver Aleva Hifo (15) runs into the end zone for a touchdown as BYU faces the Western Michigan Broncos in the Famous Idaho Potato Bowl in Boise, Idaho, on Friday, Dec. 21, 2018. (Jeremy Harmon | The Salt Lake Tribune) A flag goes down on the field after Western Michigan Broncos tight end Odell Miller (38) tangled with Brigham Young Cougars defensive back Gavin Fowler (27) as BYU faces the Western Michigan Broncos in the Famous Idaho Potato Bowl in Boise, Idaho, on Friday, Dec. 21, 2018. (Jeremy Harmon | The Salt Lake Tribune) Brigham Young Cougars wide receiver Neil Pau'u (84) flexes as he celebrates as BYU faces the Western Michigan Broncos in the Famous Idaho Potato Bowl in Boise, Idaho, on Friday, Dec. 21, 2018. (Jeremy Harmon | The Salt Lake Tribune) Brigham Young Cougars defensive lineman Devin Kaufusi (92) gets the fans pumped up as BYU faces the Western Michigan Broncos in the Famous Idaho Potato Bowl in Boise, Idaho, on Friday, Dec. 21, 2018. (Jeremy Harmon | The Salt Lake Tribune) Brigham Young Cougars wide receiver Dylan Collie (3) makes a big catch as BYU faces the Western Michigan Broncos in the Famous Idaho Potato Bowl in Boise, Idaho, on Friday, Dec. 21, 2018. (Jeremy Harmon | The Salt Lake Tribune) Brigham Young Cougars running back Riley Burt (34) runs into the end zone for a touchdown as BYU faces the Western Michigan Broncos in the Famous Idaho Potato Bowl in Boise, Idaho, on Friday, Dec. 21, 2018. (Jeremy Harmon | The Salt Lake Tribune) Western Michigan Broncos quarterback Kaleb Eleby (9) is sacked by Brigham Young Cougars defensive lineman Lorenzo Fauatea (55) as BYU faces the Western Michigan Broncos in the Famous Idaho Potato Bowl in Boise, Idaho, on Friday, Dec. 21, 2018. (Jeremy Harmon | The Salt Lake Tribune) Brigham Young Cougars running back Riley Burt (34) breaks away for a touchdown as BYU faces the Western Michigan Broncos in the Famous Idaho Potato Bowl in Boise, Idaho, on Friday, Dec. 21, 2018. (Jeremy Harmon | The Salt Lake Tribune) Brigham Young Cougars defensive back Dayan Ghanwoloku (5) gets into the end zone for a touchdown as BYU faces the Western Michigan Broncos in the Famous Idaho Potato Bowl in Boise, Idaho, on Friday, Dec. 21, 2018. (Jeremy Harmon | The Salt Lake Tribune) Western Michigan Broncos wide receiver Keishawn Watson (13) jumps over Brigham Young Cougars running back Tanner Jacobson (25) as BYU faces the Western Michigan Broncos in the Famous Idaho Potato Bowl in Boise, Idaho, on Friday, Dec. 21, 2018. (Jeremy Harmon | The Salt Lake Tribune) Brigham Young Cougars defensive back Austin Lee (11) runs the ball after making an interception as BYU faces the Western Michigan Broncos in the Famous Idaho Potato Bowl in Boise, Idaho, on Friday, Dec. 21, 2018. (Jeremy Harmon | The Salt Lake Tribune) Brigham Young Cougars wide receiver Dylan Collie (3) catches the ball under pressure from Western Michigan Broncos wide receiver Anton Curtis (3) as BYU faces the Western Michigan Broncos in the Famous Idaho Potato Bowl in Boise, Idaho, on Friday, Dec. 21, 2018. (Jeremy Harmon | The Salt Lake Tribune) Brigham Young Cougars running back Riley Burt (34) is hugged by Brigham Young Cougars wide receiver Neil Pau'u (84) after Burt scored a touchdown as BYU faces the Western Michigan Broncos in the Famous Idaho Potato Bowl in Boise, Idaho, on Friday, Dec. 21, 2018. (Jeremy Harmon | The Salt Lake Tribune) Western Michigan Broncos running back Chase Brown (28) gets tackled as BYU faces the Western Michigan Broncos in the Famous Idaho Potato Bowl in Boise, Idaho, on Friday, Dec. 21, 2018. (Jeremy Harmon | The Salt Lake Tribune) Western Michigan Broncos quarterback Kaleb Eleby (9) sits on Brigham Young Cougars linebacker Sione Takitaki (16) after getting sacked by him as BYU faces the Western Michigan Broncos in the Famous Idaho Potato Bowl in Boise, Idaho, on Friday, Dec. 21, 2018. (Jeremy Harmon | The Salt Lake Tribune) Western Michigan Broncos quarterback Kaleb Eleby (9) scores a touchdown as BYU faces the Western Michigan Broncos in the Famous Idaho Potato Bowl in Boise, Idaho, on Friday, Dec. 21, 2018. (Jeremy Harmon | The Salt Lake Tribune) Brigham Young Cougars defensive back Dayan Ghanwoloku (5) celebrates after scoring a touchdown as BYU faces the Western Michigan Broncos in the Famous Idaho Potato Bowl in Boise, Idaho, on Friday, Dec. 21, 2018. (Jeremy Harmon | The Salt Lake Tribune) Brigham Young Cougars quarterback Zach Wilson (11) takes the ball on a snap as BYU faces the Western Michigan Broncos in the Famous Idaho Potato Bowl in Boise, Idaho, on Friday, Dec. 21, 2018. (Jeremy Harmon | The Salt Lake Tribune) Brigham Young Cougars quarterback Zach Wilson (11) takes the field at the start of their game against Western Michigan Broncos in the Famous Idaho Potato Bowl in Boise, Idaho, on Friday, Dec. 21, 2018. (Jeremy Harmon | The Salt Lake Tribune) Brigham Young Cougars quarterback Zach Wilson (11) runs the ball as BYU faces the Western Michigan Broncos in the Famous Idaho Potato Bowl in Boise, Idaho, on Friday, Dec. 21, 2018. (Jeremy Harmon | The Salt Lake Tribune) Brigham Young Cougars quarterback Zach Wilson (11) runs the ball as BYU faces the Western Michigan Broncos in the Famous Idaho Potato Bowl in Boise, Idaho, on Friday, Dec. 21, 2018. (Jeremy Harmon | The Salt Lake Tribune) Brigham Young Cougars quarterback Zach Wilson (11) helms his team as BYU faces the Western Michigan Broncos in the Famous Idaho Potato Bowl in Boise, Idaho, on Friday, Dec. 21, 2018. Boise • Remember when BYU football coach Kalani Sitake said Thursday that he expected quarterback Zach Wilson to play “perfectly” in Friday’s Famous Idaho Potato Bowl against Western Michigan? Well, the third-year coach must have known something. Wilson did just that, completing all 18 passes he attempted for 317 yards and four touchdowns as the Cougars scored 35 unanswered points after falling behind by three at halftime. BYU went on to roast the Broncos 49-18 on the blue turf at Albertsons Stadium in front of an announced crowd of 18,711 mostly blue-clad fans. 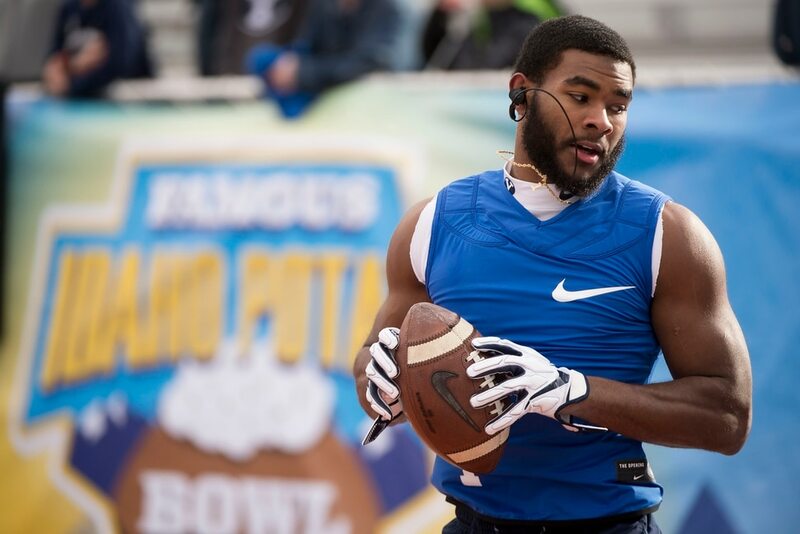 Wilson’s passer rating was 321.3 as he claimed bowl MVP honors and set numerous Potato Bowl and BYU records. The 18-year-old true freshman, making his seventh college start, said he didn’t know he had not thrown an incompletion until midway through the fourth quarter when he was taken out of the game in favor of senior Tanner Mangum, a Boise-area resident. He said he thought he had thrown “six or seven” incompletions. Wilson credited his receivers — eight caught passes — for making some “incredible” catches to keep the streak going. Specifically, Aleva Hifo made a one-handed grab that he turned into a 70-yard touchdown reception, tight end Matt Bushman wrestled a ball away from a WMU defender, and Dylan Collie followed Bushman’s takeaway catch with a diving grab for 30 yards on the 17th pass Wilson threw. His 18th and final pass went to fellow freshman Dax Milne for a 5-yard touchdown. “He set the bar for himself, but I will go ahead and set it even higher,” said Collie, who caught six passes for 124 yards and two touchdowns in his best, and final, game as a Cougar. 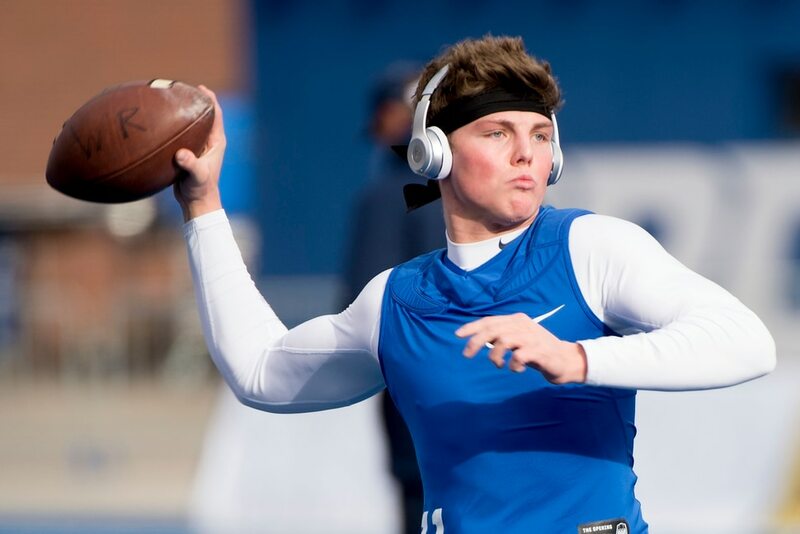 “I truly believe this kid will be one of, if not the greatest, quarterbacks in BYU history. 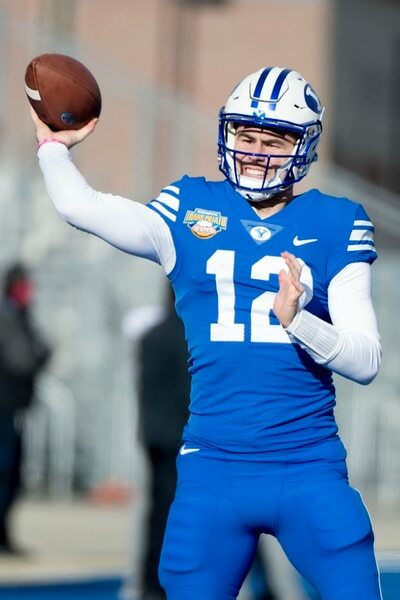 Wilson’s 18 straight completions is a BYU record in a single game and the second-most consecutive completions in bowl history, behind only Georgia’s Mike Bobo, who had 19 against Wisconsin in the 1998 Outback Bowl. Wilson tied the all-time record for best completion percentage (1.000) in any bowl. Wake Forest’s Riley Skinner was 11 for 11 against Navy in the 2008 EagleBank Bowl. Mangum, who gave way to Wilson as the starter after six games, including wins over Wisconsin and Arizona, entered the game to a big round of applause with 7:37 remaining and connected with Collie for 41 yards on the only pass he threw. Sitake said he apologized to WMU coach Tim Lester afterwards for throwing when it wasn’t necessary. Western Michigan gained 192 of its 313 total yards in the first half and took a 10-7 lead at the break, but Lester said he was uneasy with the lead because his freshman quarterback, Kaleb Eleby, was not seeing the field well. Like Sitake on Thursday, he was prophetic. Lester said the 48-yard pass from Wilson to Neil Pau’u that opened the second half for BYU was pivotal, because Wilson was hit on the play but still delivered a strike. “Once they got a lead on us, they went after our secondary pretty good,” Lester said. Wilson followed the second TD toss to Collie — which gave BYU a 14-10 lead — with TD passes to Aleva Hifo and Milne in the second half. Riley Burt, filling in for injured RBs ahead of him on the depth chart — Squally Canada, Lopini Katoa and Matt Hadley — scampered 37 yards for a score. Safety Dayan Ghanwoloku added a short TD run. Sitake said he didn’t have to give a fiery speech at halftime after the Cougars fell behind 10-7 and had been out-gained by nearly 100 yards. The Cougars finished the season with a 7-6 record and are now 15-20-1 in bowl games, having won their last two.